A wide variety of innovations in today’s digital world are revolutionizing the automotive industry. The wave of technological advancements in this industry is making our drive experience more comfortable, safer and entertaining. This article is an effort to articulate seven car technologies that may be available for our use in the coming year. Some of these technologies aim at keeping us safe, some at making our ride digitized by providing us with information about the car and the environment while others aim at making our ride more entertaining. Beside technologies from the manufacturer’s side, platforms like we want any car helps consumers to make use of the technological advancements by enabling them to buy, sell and get a value of their cars all on their smartphones. This technology has been in the news for quite some time,butnow it is entering into the definitive phase. Many brands have already been testing autonomous driving technology and aim to launch vehicles with self-driving functionalities. In fact, few cars already have the semi-autonomous capability which is why it is not far to see self-driving cars. Waymo, Google’s self-driving car technology, has launched a public trial of their autonomous vehicles which will soon hit the roads. Their self-driving vehicle has been aggressively put to tests across multiple locations in real-world conditions and has so far self-driven more than 10 million miles. That’s more drive in a single day than what the average American drives in one year. Besides, the car also takes pictures of the surroundings, analyze and process them faster than a human can. Other brands including Ford, Volkswagen, GM, and Mitsubishi have been working on their self-driving cars to make it a potential reality. The California Department of Motor Vehicles has approved some 52 different companies to test autonomous vehicles on the road so they might get on the roads sooner than we expect.Due to advancements in sensor technology, self-driving cars will eliminate the90 percent of total accidents which are caused by human error. Augmented reality dashboards (AR) will be able to identify objects outside the car. It will allow drivers to see information about objects on the windshield display. If a car is too near an object and there is a chance of collision, AR display will issue a warning to the driver and let him/her know how to avoid the collision by analyzing the surroundings. 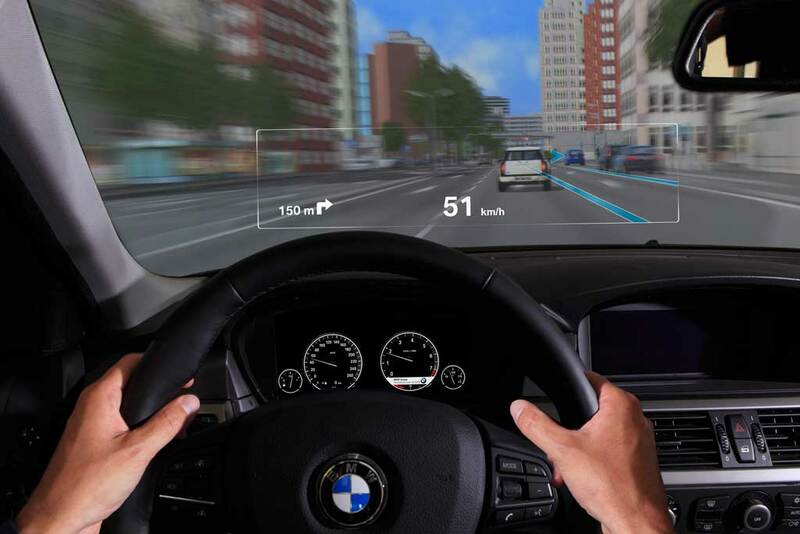 The head-up displays have already been installed in some of BMW vehicles which displays basic information. Toyota is also working on its system in partnership with Intel and Microsoft, which they call Human-Machine Interface (HMI). The eco-friendly vehicles have appealed to a significant number of people which is why the automotive industry has started working rigorously at improving this technology. Many companies have launched their electric and hybrid vehicles with improved tech features. The improvements in the Lithium-ion batteries have also enabled these cars to travel for hundreds of miles on a single charge. Most importantly, these cars have become more affordable as most of them now come under USD 30,000 which is quite reasonable for the level of functionalities that they exhibit. Leading auto companies like Hyundai, Toyota, Tesla, Nissan, Kia, and General Motors have already unveiled their hybrid and electric vehicles while Volvo aims that by 2019, all the engines they produce will be equipped with electric motors. These brands have attracted a great number of customers, so much so that around 2016 to Aug 2018 period, the global sale of electric vehicles raised from 1 million to 4 million. This figure will rise as more and more auto manufacturers implement this technology. This system already existed in Audi since 2011,but as technology advances with each passing year, new sophisticated features are added to it. The system will allow the driver to enter characters through the touchpad installed in the car and direct it or the associated apps to do a particular task, like play a song, dial a number or enter an address for the purpose of navigation. The feature is called Multi Media Interface or MMI and makes the drive experience much easier and enjoyable. We already know of curtain, head and knee airbags as part of passive safety measures that keep those inside the car safe in case of an accident. Not every vehicle may have all of them,but they are there are on the road.Soon, we will see airbags becoming part of active safety measure and help in preventing an accident or at least abate the severity of the collision. Mercedes has already been working on this technology for several years now,and we will see vehicles equipped with it shortly. The airbag is deployed from underneaththe car and will bring the car to a halt by doubling the stopping power of the car.The airbag will deploy only when the sensor senses a situation where an impact is inevitable. It will also lift the car by eight centimeters to counter the dipping motion of car during hard braking, increase bumper to bumper contact and preventing passengers from sliding under seat belts during a collision. Vehicle-to-Vehicle or V2V communication is a developing technology which allows the vehicles to talk to each other and share traffic information. The technology will allow vehicles to share data like location, speed, and direction of propagation using wireless signals. Automakers like Ford are testing V2V communication technology to reduce road accidents,and we might be able to utilize it sooner than expected. We have already heard of this technology being used in our smartphones,but it is now time for it to be added to the vehicle security system. It will allow us to unlock or even start our car using our fingerprint. Retina scanners and face recognition system are also possibilities which will allow keyless entries to our car and strengthen its security manifold. The introduction of this technology may not take much time as the latest cell phone security uses exactly the same concept. As technology continues to drive progress in the auto industry, it is not far to see these automotive technologies implemented in future cars. But, like every technology, it will not go from rare to ubiquitous overnight. Cars with such features may well be available in 2019,but as people tend not to change cars frequently, it will take a few years for these cars to be a common sight on roads. Selling your old car? Here are your options! Why Seek Professionals Help For Your Car Detailing? This blog is developed for latest news on cars, auto, bike and all about automotive industry.